Most PR people are familiar with journalistic conventions. Things like AP style, for example. We know a story starts with the lede, not lead, and about the reverse triangle approach to news writing. We know what a byline is, and are constantly on the hunt for the people behind them, to pitch stories to. We also know that it is a noisy world, and there’s much competition for the headline. PR folks often don’t know the reasoning behind what makes the cut. The choices can seem arbitrary and unfair. But would we be better off if it was some machine, and not a person, deciding what news is important? The fact is, what we call news is changing – driven by tech and not journalistic principles. More of us are getting our news from Facebook, other networks and news apps these days. And it is the tech companies – and their programmers and algorithms – that determine what appears in our news feeds. They shape news not only by filtering but also deciding what is share-worthy, what’s crap, and through their deals with news organizations, all while trying to make money and keep advertisers happy. Big tech and their solutions are increasingly the lenses through which we see the news. They insist, generally, that they’re not the media – but make no mistake. Their influence is real and significant, at almost every step of the editorial supply chain. I thought it might be interesting to look at traditional news value (see this helpful Taylor and Francis guide) vs. how a social network prioritizes the same. 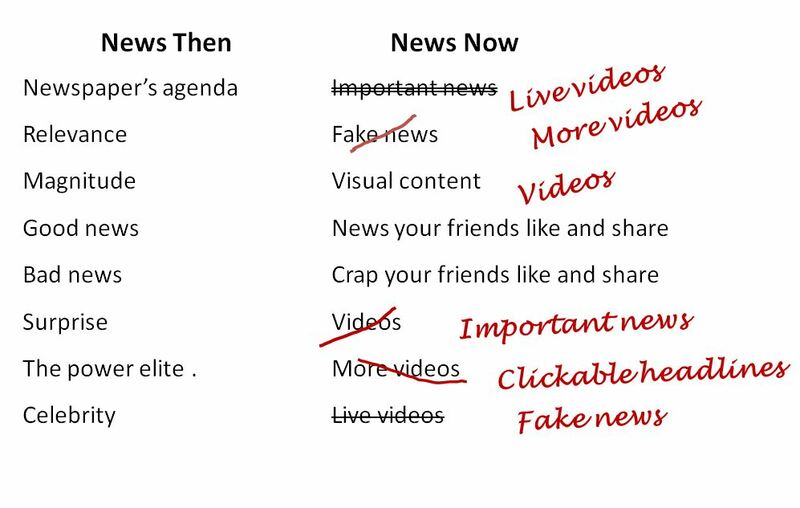 As you can see from the lists below, there’s quite a difference (OK the “News Now” list is meant to be light-hearted and not 100% accurate – but you get the idea). Another challenge is that the algorithms are constantly changing, hence all the strikethroughs. This is a big deal, in my opinion. What do you think? What does it mean for your communications strategies and news promotion? Stay tuned to this blog for further updates on the topic. This entry was posted in In the News, PR, PR Tech, Social Media, Technology and tagged Facebook, journalism, media, news, PR, public relations, social media. Bookmark the permalink.